Carex bebbii.Max Licher.SEINet.Southwest Environmental Network.swbiodiversity.org (Accessed 5/2014). Carex bebbii perennial, 20-90 cm, densely tufted, stems smooth, erect, sharply 3-angled, mostly longer than leaves; basal leaves bladeless; upper side of sheath membranous, top edge concave. Leaves alternate, blades 0.2-0.4 cm wide, upper blades elongate, leaves of non-flowering stems often crowded near top. 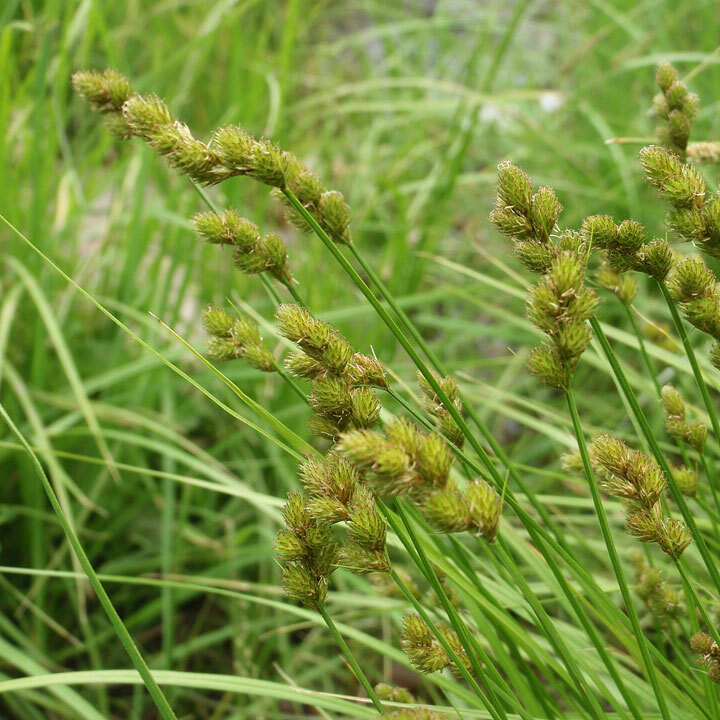 Carex bebbii perigynia By USDA-NRCS PLANTS Database. Public Domain. USDA-NRCS Plants Database – plants.usda.gov_Fotor (Accessed 12/2017). Flower spikes pale green to pale brown, 4-12, 0.5-0.9 cm long, stalkless; male flowers at base of each spike, female flowers (perigynia) membranous with green midrib, egg-shaped, about 0.3 cm long, 0.1 cm wide, one side flat, the other convex, margins winged, finely toothed, tapering to a beak, beak often pointing outward, basal scale brown; inflorescence crowded at top of stem, head-like, 1.5-3 cm wide, basal bracts of spikes shorter than inflorescence; blooms and fruits June-Aug.
Habitat: Wet, often calcareous soil, meadows, shores, soil pH 4.6-7 (USDA, NRCS 2010). Notes: Very much like C. cristatella.